With the Greene County Fair kicking off on Tuesday, one of the highlights is finding out who is going to be this year’s county fair queen. There are six candidates vying for the crown. Today we introduce Emily Finch. 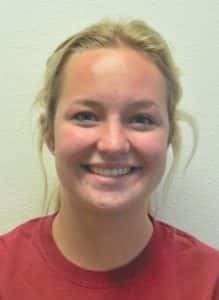 She is a recent Greene County High School graduate of the Class of 2018. Emily is the daughter or Dale and Jane Finch. She will be attending Iowa State University this fall studying agriculture business. While in high school, Emily participated in cross-country, track, 4-H and FFA. She also danced for 15-years is apart of the 4-H Young Leaders and is with the Hardin Clovers 4-H Club. She will also show six sheep at the county fair. She talks about what she would like to bring back to the county fair. She adds that she wants to be Greene County Fair Queen because she sees it as a great learning and fun opportunity to represent the county at the Iowa State Fair. To hear more from Finch as well as some of the other contestants, listen to today’s Community State Bank in Paton Let’s Talk Greene County Program.